There is an asteroid belt out in a far off galaxy. The region is effectively known as The Six Rock Divide since there are six major asteroids that make up the belt. 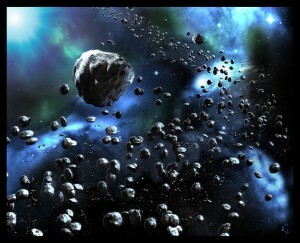 This asteroid belt was rich with valuable resources and so it was mined heavily. This period of heavy mining happened thousands of years ago by a race that is now extinct. They mined the belt down to what they referred to as Dead Rock. Dead Rock is a super dense, black rock that had no value at all and its appearance signaled when an asteroid was all mined out. Once the ancestral miners got all the value they could from Six Rock, they left and moved on to another location. Now many thousands of years later, the galaxy is embroiled in giant war due to the seat of power changing hands. Many factions are battling it out for control of the next council and looking for any advantage they can to dominate the war. One of these factions, Franklin Industries, a powerful corporation essentially has recently made an amazing discovery. The Six Rock Divide is rich with Dead Rock, which is now known to be a valuable resource for space travel. So now you have Franklin Industries moving in to grab the resources for their war machine as well as the local mining groups which are basically a loose tribe like structure that has been mining the Dead Rock and selling it off to other parts of the galaxy for years now. And to top it all off, where there is money to be made, there is of course pirates. In effect there are three major factions fighting over the Divide: Franklin Industries, the Dead Rock Coalition, and the Lost (space pirates). Many other factions are at play in the Divide, as well, though they are not part of the conflict. These include science guilds, merchant guilds, latch key space bugs, etc. You and your crew come into the Six Rock Divide at this time and it now up to you what you do with this sandbox. Do you join one of the major factions and help them win the Divide for their side? Do you make your own fortune and become the richest crew in the galaxy? Do you explore the ruins of the old ancestral race and what they left behind? I suspect you will do a bit of everything in Six Rock and it will be a blast. This doesn’t even scratch the surface of the economy, your crew, your ships, or even the tactical combat that happens when you fight on asteroids or board other ships. Those updates will come later. For now I hope you enjoy the story so far and feel free to let us know what you think! Heard mention of this game on the Gamers with Jobs podcast and my interest is piqued. I look forward to hearing more about this game. Thanks for stopping by! Let us know if there is anything you’d like to see, we are trying to be more proactive about showing off more of the game. Deadrock Divide » « It’s summer sale time again!